Reno, NV (Jan. 26, 2015)-Protect Mustangs and Friends of Animals (FoA) have filed a lawsuit against the Bureau of Land Management (BLM) to stop the round-up and permanent removal of 200 wild horses in the Pine Nut Herd Management Area (HMA) and the round-up of another 132 wild horses so that an estimated 66 mares would be forcibly drugged with the pesticide known as PZP for fertility control. In addition, the groups plan to file a temporary restraining order-asking the judge for an emergency ruling so that the BLM can't round up any horses or administer PZP until the court has time to hear FoA's and Protect Mustangs' case. The roundup is expected to last for 10 days and is slated for late January/early February. "The BLM abruptly made a decision in December of 2014 to round-up, permanently remove and forcibly administer fertility control drugs on our wild horses. This decision has long-lasting implications for wild horses," said Jenni Barnes, attorney for FoA's wildlife law program. "BLM violated the law by excluding the public from this decision and completely failing to consider its impacts. FoA and Protect Mustangs have filed this lawsuit to ensure that BLM does not destroy Nevada's last remaining wild horses." "The American public is outraged elected officials aren't doing anything to stop cruel roundups and sterilization experiments on our native wild horses," said Anne Novak, executive director of Protect Mustangs. "It's disgusting and shameful. Risky drugs like PZP and other forms of sterilization are a sham at this point because there aren't any 'excess' wild horses on millions of acres of public land." "When wild horses don't seem useful to the BLM, they're resented. Rounded up. Sterilized. Killed or otherwise displaced,"said Priscilla Feral, FoA's president. "In contrast, cows and sheep owned by large corporations and hobby ranchers are seen as having a dollar value, so ranchers are relieved from having to compete over water and grasslands with horses. Since horses are not hamburgers, Nevada and the BLM want them gone. People don't want this madness anymore." The lawsuit states that the defendants did not prepare an Environmental Assessment for the proposed roundup and instead relied on the 2010 environmental assessment for the Clan Alpine, Pilot Mountain and Pine Nut HMA Gather Plan, which does not take into consideration science that shows the negative side effects associated with PZP. Furthermore, the BLM did not solicit public comments. In fact, FoA employees traveled to Nevada on Jan. 22 to participate in a BLM public meeting regarding the Carson City Resource Management Plan, which includes the Pine Nut HMA, but the BLM denied the public the ability to comment. When Edita Birnkrant, FoA's campaigns director, got up and spoke at the microphone anyways, she was silenced-BLM shut off the microphone and ejected her from the meeting, just like BLM removes wild horses from public land. "I was infuriated that the BLM dared to hold a 'public' meeting yet forbid the public from speaking," said Edita Birnkrant, FoA's campaign director. "BLM employees specifically said there would be no discussion of the Pine Nut roundup during the intro to the meeting. After the intro, I took over the microphone to call out the sham of a BLM public meeting that shut out the public. I said that FoA was there to oppose the BLM's extinction plan for wild horses in Nevada." Novak pointed out that according to the National Academy of Sciences' 2013 report, there is "no evidence" of overpopulation. Ranchers scapegoat wild horses because they don't want to share the public land they lease to graze their livestock. So they bully the Bureau of Land Management to remove wild horses. In Beaver and Iron County, Utah, where wild horses are scapegoated, data shows cows and sheep outnumber wild horses 10.6:1; in Oregon it's 33:1. And prior to a massive roundup in Wyoming last summer, there were 356,222 cattle, 45,206 sheep, and only 1,912 wild horses. It seems that it's easier for the BLM to accommodate ranchers and manage wild horses to extinction, than to consider holistic ways to manage our public lands. 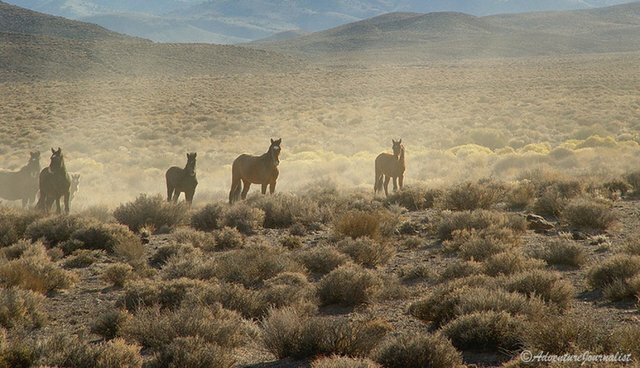 "Wild horses need to be protected in Nevada," said plaintiff Craig Downer, a wildlife ecologist who has studied the Pine Nut herd for decades and author of The Wild Horse Conspiracy. "They restore the ecosystem as a deeply rooted native in North America with a unique niche that helps the other species thrive." "The bottom line is the BLM is ignoring the public's right to be heard about a heinous roundup, paid for with tax dollars, on public land," explains Novak. "And that's just unAmerican."